Sadly, it is not highly publicized that she is responsible for an image that appears on a coin that millions of Americans use every single day. Even more, many people don't know that she also created many other portraits of prominent African-Americans like Duke Ellington, Mary McLeod Bethune and Booker T. Washington. As a woman who was very committed to teaching art to others, she established the Selma Burke Art School in New York City in 1946. 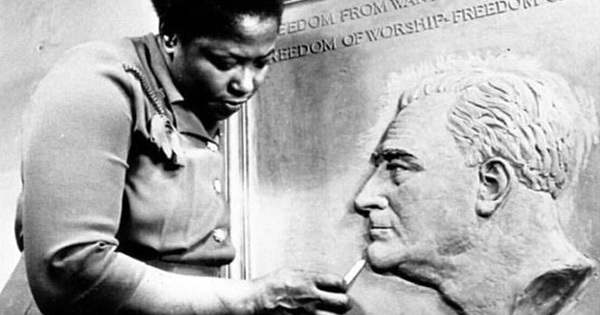 She later also opened the Selma Burke Art Center in Pittsburgh, Pennsylvania. Many of her sculptures can still be seen in various museums such as the Performing Arts Center in Milwaukee, the Hill House Center in Pittsburgh, the Schomburg Center for Research in Black Culture in New York City, the Smithsonian Museum of American Art, and more. Ironically, she married an architect named Herman Kobbe, but he died shortly after their marriage. Burke, however, lived to be 94 years old. She died on August 29, 1995 of cancer in New Hope, Pennsylvania, where she had lived more than half her life.